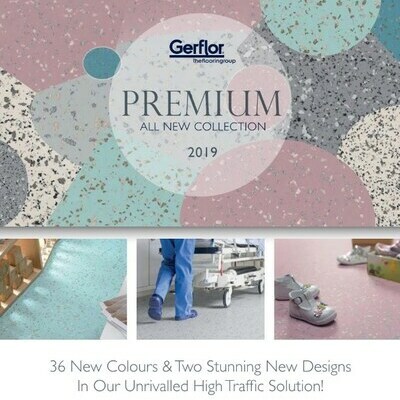 Leading names in the Sydney and Melbourne design scenes welcomed the chance to view the new Gerflor Premium and Creation 55 Collections at exclusive launches at the Museum of Contemporary Art (Sydney) and Australian Centre for Contemporary Art (Melbourne). In keeping with the artistic ambience of the venue, Gerflor curated a stunning showcase of the new roll and plank products that were creatively displayed as art installations. Global Artistic Director, Gino Venturelli flew in from France to share the creative journey for these products that will continue a long, proud chapter in the Gerflor portfolio. “These Premium roll products and Creation 55 planks embody the design influences that are shaping our commercial inter spaces globally. They bring fresh palettes and texture into play to offer inspiration and practical solutions for architects, designers and end users seeking premium products from both the design and durability perspectives,” Gino Said. National Product Marketing Manager, Jutta Fronert, welcomed Gino’s visit to Australia that she said signified the importance of the new collection of Premium and Creation 55. “It is very exciting for the Australasian team to add Gino’s expertise and insights to the new Premium and Creation 55 launches. These products have been hallmarks of our success in commercial installation over many decades and we have no doubt that these stunning new colors and design will continue to give creative solutions in decades to come,” Jutta said.